Are Pakistan's allegations against RAW mere conspiracy theories? Are all of Pakistan's problems today entirely of its own making? Is RAW just a dis-interested spectator of the grisly drama being played out in Pakistan? Let's try and answer these questions by looking at the history of the Indian spy agency and its successes claimed by retired Indian intelligence officer RK Yadav in his 2014 book "Mission R&AW". Although the book cites some of RAW's actions in China (Tibet), Sikkim (annexation) and Sri Lanka (creation and support of LTTE), most of it is devoted to Indian agents' accomplishments in destabilizing and disintegrating Pakistan.
" Wali Khan (son of Abdul Ghaffar Khan aka Bacha Khan) wanted moral, political and other support from Mrs. Indira Gandhi. R.N. Kao sent hs deputy Sankaran Nair to negotiate as the Indian representative. Since Pakistan embassy was keeping watch on the movements of Wali Khan, the rendezvous was shifted to Sweden where Nair and another R&AW man of Indian mission I.S. Hassanwalia met Wali Khan. Subsequently all sorts of support was given to Wali Khan by the Indian Government till 1977 when Indira Gandhi lost election". There was an agent of R&AW-Hashim Qureshi in Srinagar.......R&AW persuaded Hashim Qureshi to work for them.....After the plan was given final shape, on January 30, 1971, Hashim Qureshi along with another operative Ashraf Qureshi, his relative, was allowed to hijack a Fokker Friendship plane Ganga of Indian Airlines with 26 passengers on board, to take the plane to Lahore airport. R&AW allowed him to carry a grenade and a toy pistol inside the plane. Pakisani authorities at Lahore airport allowed the plane to land when they were informed that it had been hijacked by National Liberation Front activist militants of Pakistan Occupied Kashmir. All India Radio soon made broadcast of this hijacking and the whole world was informed that the Pakistan Government was behind this hijacking...The incident overtly gave India the right opportunity which was planned by R.N. Kao, to cancel the flights of Pakistan over its territory which hampered the plans of Yahya Khan to send its troops by air to curb the political movement of Mujib in East Pakistan. Since the Indian Army was not prepared and well-equipped for an immediate army action at that point (March 1971), it was planned to raise and train a guerrilla outfit of the Bengali refugees of East Pakistan by R&AW which would harass the Pakistan Army till the Indian Army would be ready for the final assault to the liberation of East Pakistan. She (Indira Gandhi) then asked R.N. Kao, Chief of R&AW, to prepare all possible grounds for the army for its final assault when the clearance from General Maneckshaw was received for its readiness for the war. "..He (Kader Siddiqui aka Tiger Siddiqui) was the main operative of R&AW in the most vital areas of strategic operation around Dacca... Kader Bahini played havoc with the communication system of the army (Pakistani), ambushed enemy columns, blew up supply and ammunition dumps and assaulted a number of enemy convoys.....all these three guerrilla outfits created by R&AW with the help of BSF and the (Indian) army proved a vital force .. "
Obviously, the author is silent on India's current activities against Pakistan, particularly its covert war being waged from Afghanistan through its agents who have infiltrated Tehreek-e-Taliban Pakistan (TTP) and Balochistan Liberation Army (BLA). "How do we tackle Pakistan? .. You make it difficult for them (Pakistan) to manage their internal security... Pakistan's vulnerability is many many times higher than India's....Taliban have beheaded 23 of their (Pakistani) soldiers...funding can be countered by giving more funds...more than one-and-a-half times the funding they have available and they'll be yours..the Taliban are mercenaries...go for more of a covert thing"
Is India responsible for all that is wrong with Pakistan today? Obviously not; however, its spies are promoting and exploiting the ethnic, regional, religious and sectarian fault lines that exist in Pakistan. RAW is instigating and thriving on the chaos gripping the Islamic Republic. Pakistan's response to its problems of growing violence has to be comprehensive; it needs to deal with both internal and external causes. It has to develop and promote a powerful counter narrative to appeal to misguided young men who are drawn to the militants making references to the Quran and the Hadith as part of their call to violence. The counter narrative has to explain the basics; it has to be based on the Quranic verses proclaiming Prophet Mohammad (PBUH) as Rehmat ul lil Alameen (Blessing to the worlds); it has to explain Misaq e Madina, the constitution of the first real Islamic State established by Prophet Muhammad (PBUH) in Madina. "This is a document from Muhammad the Prophet (may Allah bless him and grant him peace), governing relations between the Believers i.e. Muslims of Quraysh and Yathrib and those who followed them and worked hard with them. They form one nation -- Ummah." It clearly says that all citizens of "Yathrib" (ancient name of Madina), regardless of their tribe or religion, are part of one nation--"Ummah". So the word "Ummah" here does not exclude non-Muslims. Further into the "Misaq" document, it says: "No Jew will be wronged for being a Jew. The enemies of the Jews who follow us will not be helped. If anyone attacks anyone who is a party to this Pact the other must come to his help." The Misaq assures equal protection to all citizens of Madina, including non-Muslim tribes which agreed to it. The contents of Misaq-e-Madina, Islam's first constitution approved by Prophet Mohammad 1400 years ago, appear to have inspired Quaid-e-Azam Mohammad Ali Jinnah vision of Pakistan where people of all religions and nationalities live in harmony with equal rights and protections under the law. Internal efforts alone will not succeed; Pakistan also has to mount a serious counter-intelligence challenge to blunt RAW's efforts to destabilize and disintegrate Pakistan. Pakistan has to try and stabilize Afghanistan to deny India what former US Defense Secretary Chuck Hagel described as "India's second front against Pakistan". The best and most sane advice that can be offered India now is to think of the consequences of its actions in destabilizing its neighbor; particularly the fact that it s a large nuclear-armed country with a population approaching 200 million. India may find some short-term satisfaction by inflicting huge damage to its neighbor. But what if it leads to Pakistan becoming a REALLY failed state triggering a massive refugee problem along India's long border? What if the India-funded groups like TTP and BLA actually succeed in defeating the Pakistani military? What would that do to India? What if it triggers an unintended devastating nuclear war? I hope saner minds will prevail in New Delhi to prevent a major human catastrophe in South Asia. Has Modi Stepped Up India's Cover War Against Pakistan? Thank you. I am proud of RAW. The fact that so far Pakistan is not able to prove any killing directly to RAW, shows how good we are. Read the comments by Pakistanis who are obviously not as smart as you. They are all questioning "why it is not RAW when we were originally told RAW is the reason". After reading this I think RAW has been underrated in the world and that has worked for them. Though they are our enemies but you have to admit they have used pakistans weaknesses to perfection so far. Anyone who thinks that RAW wasn't involved in sri lankan team bus attack is till living in a doodoo land. ISI has completely failed to tackle RAW so far. Reports of dissatisfaction and disagreement over an intelligence deal that Afghanistan signed with neighboring Pakistan have surfaced (RFE/RL, Pajhwok). It was reported on Monday that the spy agencies of the two countries would share intelligence on militant groups near the border, according to a Memo of Understanding that was signed. According to an anonymous government official who spoke to RFE/RL, Chief Executive Office Abdullah Abdullah opposes the document, which allows cooperation between the two country's intelligence agencies, and considers the deal "unacceptable." Another Afghan official told Pajhwok Afghan News that a deal had never been signed, contrary to all other reports. Najibullah Manali, the media and culture advisor at the National Security Council, told Pajhwok that Afghan President Ghani would consult parliament and civil society groups over the proposed agreement, which is still in draft form, according to him. R K Yadav left the Research & Analysis Wing (R&AW) in 1989 with the reputation of being one of the toughest spies in the outfit. As a Class I officer recruited in 1973, Yadav served on the China desk and various other postings in Rajasthan and Punjab. Sources say he was close to R&AW founder-director R N Kao and his successor K Sankaran Nair. 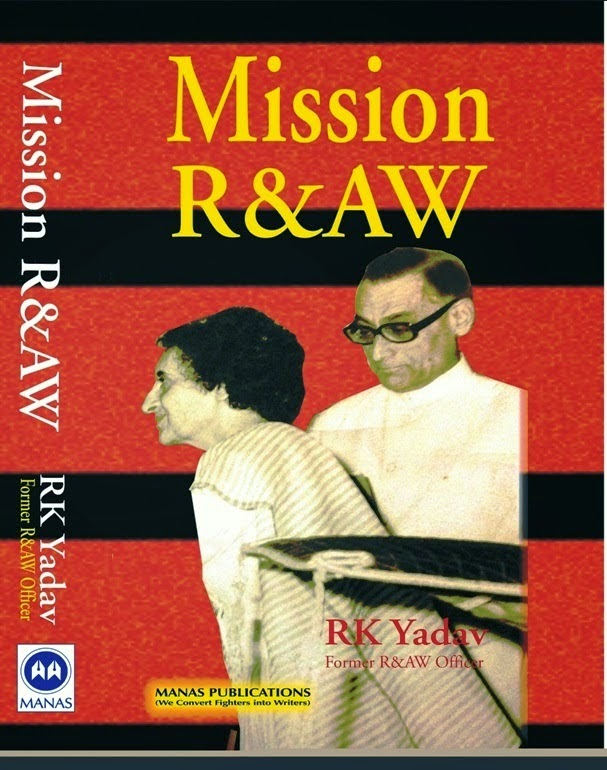 Although little is known about the functioning of R&AW, Yadav in his upcoming tell-all book ‘Mission R&AW’ has given explicit details, including vanished R&AW spies and the external Intelligence agency’s role during the 1975 Emergency. Although the CIA was found directly involved in compromising two R&AW officers Rabinder Singh and K V Unnikrishnan, Yadav claims that at least eight other R&AW officers managed to clandestinely migrate and settle in foreign countries like the US and Canada with the help of their spy agencies. Sikander Lal Malik, personal secretary to Kao for 17 years, managed to get two years’ extension after completing his mandatory tenure in New York. Malik got a green card with the help of US officials, and resigned from the R&AW. Yadav says Malik settled in the US permanently in 1976 and he could have been debriefed enough to have extensive damage to Indian Intelligence. Another senior field officer Ashok Sathe was recruited by the CIA while posted at the Indian Mission at Ulan Bator in Mongolia. Sathe was covering China operations and was later transferred to Khorramshahr, Iran. While serving there, Sathe was caught embezzling secret funds and was recalled. He set fire to his office, destroying all the secret documents before departure and subsequently retired from R&AW in 1977. “Soon after retirement, it was discovered that Sathe had a green card. He settled in California,” Yadav claims in his book. There has been much speculation over the fate of Rabinder Singh, the R&AW agent who was spying for the CIA, when he disappeared before he was apprehended for spying for the US. He was a joint secretary in R&AW at the time. Singh flew to America from Kathmandu along with his wife on May 7, 2004 using a fake identity in the name of Mr and Mrs Rajpal Prasad Sharma. The R&AW unit at Kathmandu did nothing despite clear intelligence on Singh’s escape plans. The R&AW even managed to get copies of their visas and embarkation cards. These documents reveal that the CIA on April 7, 2004, issued US passport number 017384251 to Singh. His wife Parminder Kaur was also given a US passport on the same day in the name of Deepa Kumar Sharma. Both boarded Austrian Air flight number 5032 on May 7, 2004, from Kathmandu. Singh was assisted by CIA operative David M Vacala. What is the success story of ISI ? Is it very poor due to incompetence or their good nature. Ramesh: "What is the success story of ISI ? Is it very poor due to incompetence or their good nature. " Isn't ISI behind every thing that goes wrong in India? Isn't that what Indian media and politicians have us believe? 4. Pakistanis can not leave the area (AfPak) when we (Americans) do. They have to try and stabilize Afghanistan with a favorable Islamic government so they can move their 100,000 troops from their western border to the eastern border with India which---whether we like it or not, they see as a bigger threat. 5. We (US) have created the mess in South Asia and the Pakistanis have to sort it out. Our (US) problems in Afghanistan are of our own making. Yeah, but the number of killings is far more in Pak than in India. Does that translate to their success record. Also few times they have been caught too, something RAW has avoided despite so many high profile killings. You yourself said in the Viewpoint program that "badnaam ISI hua hai, RAW nahin". How did this happen. Spies - the forgotten warriors of the covert wars. They cross borders to help governments seek vital information and also to carry out secret operations. Though not remotely as glamourous a profession as cinema would like us to believe, their story takes on darker hues if they happen to be caught in enemy terriorry. Many don't return and those who do, find themselves shunned and unrecognised by the very people who recruited them. At Delhi's Jantar Mantar, a group under the banner of the Jammu Ex-Sleuths Association, are sitting in protest. They consist of those who call themselves ex-spies, family members of those still in Pakistani captivity and of those who died in Pakistani jails. Their demands do not appear to be much, but they haven't been met in all these years. Rehabilitation, compensation and perhaps a little recognition is all that they ask for. Here are a dozen stories, as told to us, of the spies who came back and those who didn't. After working for an intelligence agency for 18 years accompanying spies as a guide, Ramraj says he was sent to Pakistan as a spy on September 18, 2004 but was caught the very next day. After two years in captivity, Ramraj was finally sentenced to jail in Pakistan for six years. Upon returning to India after almost eight years in February 2004, he tried to reach out to the officials who had sent him as a spy, but Ramraj says they refused to recognise him. After completing a year of training, he was sent to Pakistan in 1988. His job was to garner information about the arms and ammunitions used by the Pakistan military. With the job done, he was returning to India after two years but was caught on the border. He was taken to Sialkot's Gora jail for interrogation and was confined there for around two-and-a-half years. The documents he had collected were also seized and he was sentenced to 14 years in prison. He was released from jail in 2006. Trained as a photographer for almost a year before he was sent by an intelligence agency to Pakistan in 1994. While returning back to India on June 13, 1997, he was arrested and was interrogated in Sialkot's Gora jail for a year and kept under detention before a court imprisoned him for 10 years in 1998. 59-year-old Ram boasts that he had crossed the border roughly 75 times in three years before he was finally caught. He was sent back to India on July 7, 2008. Kamal Kumar says his father Om Prakash had gone to Pakistan in 1998. His family came to know about this from a letter that his father sent from Pakistani captivity. Om Prakash would send his family letters regularly, but his last letter arrived on July 14, 2012. For over a year Kamal has no clue whether his father is alive or not. While a political ado is being witnessed in Pakistan on the suspected change of the Pak-China Economic Corridor route, Chinese authorities have cautioned local authorities of a possible terror attack aimed at making the project a failure. According to them, insurgents in Balochistan have prompted security fears for the 3,000-kilometre-long route in the province, a senior security official told The Express Tribune on Friday. He said in addition to the insurgents, many foreign hostile intelligence agencies could also extend their support to the militants to sabotage some key projects particularly on the eastern alignment — Gwadar to Quetta — where work has already started. “The Chinese have sounded a note of ‘caution’ soon after reports suggested foreign agencies’ support to militants,” said the official, who attended an important meeting discussing key issues relating to Gwadar Port and Economic Corridor at the Ministry of Defence this week. He added that the meeting also discussed concerns the Chinese authorities reminded Pakistan’s military and civilian government about an attack on state-run installations in Gwadar district last month, which were conveyed last month. Meanwhile, a special security division consisting of more than 8, 000 military personnel (nine army battalions) has been trained and will guard key projects linked from Hyderabad to Karachi and Gwadar through N-10 East Bay Expressway along the coastal line, officials overseeing the security of this route said. They further said that an estimated 9, 000 security personnel – comprising Rangers, Levies, police, scouts – making up six wings will assist the military to guard more than 15,000 Chinese workers on this route. Moreover, a major-general-rank officer will command the entire unit. Apart from guarding the economic corridor, an estimated 8,000 security officials have already been deployed for more than 8,112 Chinese workers executing 210 projects in Pakistan. An official of the Ministry of Interior revealed that the security layer around the Gwadar International Airport — a project costing $230 million to start this month — has been doubled following recent threats. A similar case of security is with China-Pakistan Friendship Hospital and Pak-China Technical and Vocational Institute falling under the jurisdiction of Balochistan, he added. Security will have to be strengthened further as around 7, 000 additional Chinese workers are expected to join the already engaged teams to execute multi-billion projects around the route connecting Kashgar with Pakistan at Kunjarab – a point from where China wants to link to Gwadar port in the Arabian Sea. Commenting on the complex situation, former caretaker interior minister Malik Habib said the reported presence of foreign elements in Balochistan poses a big challenge for law enforcement agencies to provide security to Chinese workers. “The economic corridor is strategically very important — many hostile agencies have started backing Baloch militants,” he said. Substantiating his point, Rana said threats such as tribal feuds, militants in Diamer, Baloch insurgents, political issues, nationalist and separatists groups link directly to the corridor security. Even a very strongly pro-Indian American analyst Christine Faire recently described Modi as a KKK wizard. "3. It's "flat out wrong" to say that "Indian Muslims do not participate in terrorism". And what is your point? Do you take pride that in the fact that indian muslims are terrorists? In any case, how many killings Indians muslims do on fellow muslims. I don't see Shia vs Sunni killings in India as much as the land of pure. Is there a thought process in your writing. From the above it is clear that there are far more deeply alienated pakistanis willing to kill other pakistanis than muslims in India. This is seen from clock work like regular killings in Pakistan. Ramesh: " Yeah, but the number of killings is far more in Pak than in India." Ravi: " Do you take pride that in the fact that indian muslims are terrorists?...Is there a thought process in your writing. From the above it is clear that there are far more deeply alienated pakistanis willing to kill other pakistanis than muslims in India. This is seen from clock work like regular killings in Pakistan...."
I think you are having serious trouble in reading comprehension....not a surprise given the fact that Indian kids rank near the bottom on international standardized tests like PISA and TIMSS. Since you are incapable of understanding my comments, let me try and help you. What you are asking me about are direct quotes from your India-loving and beloved by Indians Dr. Christine Fair. It seems to me that in her remarks, she is pointing out India's huge vulnerabilities to covert action, just as your hero Ajit Doval has detailed Pakistan's vulnerabilities in his speech at Sastra University, a video of which I have shared in this post. NEW DELHI: Days after PM Narendra Modi's China visit, national security advisor (NSA) Ajit Doval has raised objections to the manner in which China deals with the border dispute with India and hinted at its hypocrisy in the matter. Speaking at a BSF function, Doval said China's claims on Tawang (in Arunachal Pradesh) were in contravention of accepted principles of border settlement. Calling it hypocrisy, Doval said China was ready to accept the McMohan Line on its border settlement with Myanmar but not with India. He, however, stressed that any diplomatic relation with China was incumbent upon resolving the border issue. The statements are significant given that India has been trying to articulate a stance where it is willing to resolve the border dispute but also ready to push its own terms for the same. "China's stand on the border dispute has been in complete contravention of accepted principles. They have accepted the McMohan Line while settling the border with Myanmar and then they say that the same line is not acceptable in case of India, particularly in Tawang. The settled population in these areas has been part of the national mainstream (of India) all through," Doval said while delivering the Rustamji Memorial Lecture on the 50th anniversary of BSF's foundation. Doval, however, cautioned that India could not ignore the dispute. "We have to settle this dispute. China is an important country for us. It is one of the world's largest economies. It has got a long border with us. It has a special relationship with Pakistan. Both these countries are nuclear and not the kind of democracies that we are," Doval said. He also said that while bilateral relations were improving, forces needed to remain vigilant. "With China we have got a very long border which is 2,488 km long. A very difficult terrain. In the bilateral relation with China, border is a critical and vital issue. All advancements in bilateral relations that we make vis-a-vis China centre around the border dispute. Maintenance of peace on the border is important for this," Doval said. "For the last 30 years, not a single bullet has been fired. But the number of intrusions have gone up and down over the past one year. Bilateral relations have improved of late but we need to remain vigilant. We are particularly worried about the eastern sector," he added. I think most Indians would prefer a failed state Pakistan than a mini India(economically speaking) which could occur if the Chinese investment lives up to the hype. Also defined failed state India will never invade Pakistan so a Afghan style failed state is next to impossible only a more chaotic less competent version of today's state is the worst case scenario. If Pakistan really wants to turn back the clock and have a relation which existed between 1948-1965.A cold peace and de facto visa free travel. 9 January - A car suicide-bomb was blasted by Tehrik-i-Taliban Pakistan near the car of a senior police officer Chaudhry Aslam Khan, in which Khan was killed with two others. 1 March — A bomb killed at least 11 people and another 10 injured in Federally Administered Tribal Areas. 8 June - At least 24 people were killed when militants attacked a Bus carrying Shia pilgrims from Iran to Quetta in Balochistan province of Pakistan. At least 30 people were killed when terrorists attacked Jinnah International Airport in Karachi on the night of June 8. The 10 Militants were killed in a combat that lasted for 5 hours. In the first incident, unidentified men fired at a car in the Kooza Bandi village of Swat Valley, killing three people including a police guard. In a separate incident, up to six militants stormed a checkpoint in the northwestern town of Dargai, that lies in the Malakand region neighbouring Swat. Two Levies personnel were killed in the attack, Express News reported. 6 September - Pakistani Navy frigate PNS Zulfiquar was attacked and briefly captured by al-Qaeda and rogue Pakistani Navy officers before being recaptured by Pakistani forces. The attack was intended to use the Zulfiquar's anti ship missiles to attack the U.S Navy Fleet in the Arabian Sea. 10 militants which including 4 rogue Pakistani navy officers were killed in ensuing operation to recapture the ship. One rogue officer detonated a suicide bomb inside the ship after being surrounded. 4 other officers who were involved but who did not participate in the attack were later apprehended. 2 November - 2014 Wagah border suicide attack: An attack on the Wagah Border, close to the Pakistani city of Lahore and the Indian city of Amritsar killed more than 60 people with more than 110 injured. There were no initial claims of responsibility. 7 November At least 6 people were killed and 4 wounded in two explosion in Mohmand Agency. 16 December 2014 Peshawar school attack: At least 132 children among over 141 killed by Taliban militants who stormed an army-run school in Peshawar city. Seven militants were also killed during the SSG rescue operation. NEW DELHI: Asserting that only "terrorists can neutralize terrorists," Defence Minister Manohar Parrikar on Thursday said India will take pro-active steps to prevent a 26/11-type attack planned from foreign soil. "There are certain things that I obviously cannot discuss here. But if there is any country - why only Pakistan - planning something against my country, we will definitely take some pro-active steps," Mr Parrikar said, adding those steps could include pressure tactics. Using the Hindi phrase "kante se kanta nikalna (removing a thorn with a thorn)", the Defence Minister also said, "We have to neutralise terrorists through terrorists only. Why can't we do it? We should do it. Why does my soldier have to do it?" he said, refusing to elaborate. Mr Parrikar made the remarks during a programme organised by a private news channel. When asked what the government's reaction would be in the event of an attack similar to the 2008 Mumbai terror attacks or the 2001 Parliament House attack, he said the best response would be to ensure it does not happen. The minister said that the Army has been given orders to neutralize infiltrators trying to enter India. "I can only say that anyone trying to infiltrate will be neutralised," he said. The minister also said that instructions had been given to take precautions to ensure there was no "collateral damage" and that no Indian soldiers lost their lives. "Take precaution there is no collateral damage. Don't touch civilians," he said. Asked what had changed from the previous government's tenure, the minister said, "Porosity on borders is less; intelligence has improved". Mr Parrikar also said he would stand by the Army at any cost if they were right. The adviser to the prime minister on national security and foreign affairs, Sartaj Aziz, expressed serious concern over the statement made by Indian Defence Minister Manohar Parrikar that India will use terrorism to counter terrorism from other countries. This statement, Aziz said, only confirms Islamabad’s apprehensions about India’s involvement in terrorism in Pakistan. “It must be the first time that a minister of an elected government openly advocates use of terrorism in another country on the pretext of preventing terrorism from that country or its non-state actors,” said the national security adviser. Pakistan sincerely pursues a policy of good neighbourly relations with India, maintained Aziz. “Terrorism is our common enemy and it is vital for the two countries to work together to defeat this menace, from which Pakistan has suffered much more than almost any other country,” he asserted. "The statement of Indian defence minister is open and blatant admission and declaration of sponsoring terrorism," Defence Minister Khawaja Asif said in an official statement issued late on Saturday. Asif said Indian defence minister specifically mentioned that regulation will not be used to quell terrorist activities and terrorism will be promoted instead. "This is the worst kind of declaration by a state functionary of cabinet level which confirms that India is sponsoring terrorism against its neighbours in the name of preventing terrorist activities," Asif said. Earlier, Indian Defence Minister Manohar Parrikar, in a shocking and radical statement, has asserted that terrorists have to be neutralised only through terrorists. “India will take proactive steps to prevent a 26/11 type attack,” Press Trust of India quoted him saying. Commenting on the shocking utterances of the Indian Defence Minister, a defence analyst said the statement was appalling and beyond comprehension. Speaking at an event in New Delhi, the minister used the Hindi phrase “kante se kanta nikalna” (removing a thorn with a thorn) and wondered why Indian soldiers should be used to neutralise terrorists. The proactive steps, he said, could include pressure tactics. “We have to neutralise terrorists through terrorists only. Why can't we do it? We should do it. Why does my soldier have to do it?” he said and added that the issue could not be discussed beyond this. “There are certain things that I obviously cannot discuss here. But if there is any country, planning something against my country, we will definitely take some pro-active steps,” he said. The defence analyst lamented that the menace of terrorism could not be defeated by promoting state-sponsored terrorism. India, he added, was carving out a disastrous strategy as it would never help in rooting out terrorism, which was a global issue threatening all states. The international community should take notice of this irresponsible statement, which was reflecting a sick mindset, he stressed. The main objective of the RAW is to create internal trouble in neighbouring countries and take benefit from the trouble that the neighbouring countries face(Machination of RAW in South Asia and Movement of RAW in Nepal/ by Dr Shastra Dutta Pant). The analysis of Indian foreign policy trends shows that the Indian governments had adopted an aggressive attitude and covert means for attaining its two permanent foreign policy goals: (a) to attain a hegemonic position in South Asia; (b) to play a role in international system based on Kautilyan principles. Indian governments have used intelligence agencies, not only for monitoring the activities of neighbouring States, but also as a covert forward base to achieve its goals and to implement its hegemonic policies in the region. Over the years RAW become an important instrument for promoting the hegemonic influence of India in the Asian region and has also played a significant role in enhancing India’s image as an important international actor. RAW has now acquired the important role of being the covert instrument of Indian national power and will remain decisive actor in furthering Indian interests and future Indian hegemonic ambitions in the region. Indian Imperialism by Isha Khan, (http://www.countercurrents.org/khan131007.htm). India has been openly meddling in Nepal’s internal affairs by contriving internal strife and conflicts through RAW to destabilize the successive legitimate governments & prop up puppet regimes which would be more amenable Indian mechanization. Armed insurrections were sponsored and abetted by RAW and later requests for military assistance to control these were managed through pro-India leaders. India has been aiding & inciting the Nepalese to collaborate with the Nepali Congress. For this they were supplied arms whenever the king or the Nepalese Government appeared to be drifting away from the Indian dictates & impinging on Indian hegemonic designs in the region. In fact under the garb of democratization process, the Maoists were actively encouraged by the RAW to collect arms to resort to open rebellion against the legitimate Nepalese governments( RAW The Rascal by Prem Raj http://www.lankaweb.com/news/items08/300408-1.html). Indian sources, including journalists, have put on record how much before 1971 RAW had established the network of a separatist movement through ‘cells’ and military training camps in Indian territory adjoining Bangladesh. The Mukti Bahini were all in place organisationally to take advantage of the political trouble in 1971 and carry out acts of sabotage against communication lines so that Indian forces simply marched in at the ‘right’ time. RAW agents provided valuable information as well as acting as an advance guard for conducting unconventional guerrilla acts against the Pakistani defence forces. At the time when local newspapers, political leaders, intellectuals, among others, are talking about the active presence of Indians while destabilizing our politics as well as the economy, thus making defunct one after another institutions, Pant has brought out the publication “Nepalma RAW Ko Chalkhel (Movement of RAW in Nepal). Indian territory? How did they get arms from India? Why the five political parties are launching a “joint-movement” at the time when the Maoists have announced cease fire? Why the political parties are trying to limit the Royal Palace role as well as the Army affairs? Why KV Rajans are here at the time of change of the government? After all, who are running such games from behind the scene? parties do not speak about the Kalapani issue, the India constructed embankments inundating Nepalese fertile soil, border encroachment by the Indians, among others. while creating Bangladesh from Pakistan, RAW activities in Bhutan, Maldives, Pakistan, Sri Lanka and Sikkim annexation. The main objective of the RAW is to create internal trouble in neighbouring countries and take benefit from the trouble that the neighbouring countries face. That apart, their present interest towards Nepal is to fail the Nepalese economy and create monopoly in the Nepalese market. India is showing double-standards towards Nepal. On the one hand the Indian government is supporting our government with arms on the other the RAW is supporting the Maoists. RAW, a powerful Indian intelligence – Research Analysis Wing – ultimately aims to defunct Nepal.The publication has cited on Nepal-India government level relations,relations of political parties and people of the two countries, and Nepal’s relations with RAW.The publication has also referred to the RAW intention and expectations in Nepal. Basically, I foresee a simple flow chart here. If RAW as all Pakistanis now claim, is behind terrorism in Pakistan, then Pakistani officials should share the plentiful, concrete and corroborated evidence from the various terror sites with China, US, Saudi Arabia, UK etc. India will be accused of sponsoring terrorism and will become an international pariah state. If charges against RAW are blatantly cooked and calculated by the Pakistani Generals, then Pakistan is allowing the enemy within to continue at will and that is very very frightening. Anarchy and more disaster loom for Shias, Ahmadis, Hindus and christians. @Nigel: Did you study in Pakistan? The incoherent logic makes it suspicious that you did study there only. Re-read your nonsense. The second para answers the question asked in the first para. It is a myth that poor unemployed people are drawn to terrorism. According to sources in CORPS, MQM has been imbedded with many RAW agents. Money is funneled through UK or US where MQM has a network and it reaches to support activities in Pakistan. "According to sources in CORPS, MQM has been imbedded with many RAW agents." This is believable. I certainly will not deny it. India is merely using people disgruntled with Pakistan, just like Pak does it in Kashmir, did it in Punjab in 1980s and are still doing it in rest of India via muslims(IM). That they are not as successful shows their own incompetence (as is all other department of Pakistan), or the superiority of Indian law enforcement to not allow it to happen as frequently as in Pakistan. Remember Hamid Gul's grandiose plan "death by thousand cuts". That being said, blaming RAW for incessant killings in Pakistan is still a joke, given that the killers have clearly identified their jihadi feelings against non Sunnis. Remember that boat blowing incident in Dec 2014. Had it not happened, there would have been another Mar 1993 in India. "It just means even Pakistani proxy warriors are far more humane than than their Indian counterparts"
It could also mean that Indian law enforcement are far more competent in preventing attacks. Remember that boat incident in Dec 2014. In many South Asian Think Tank circles, a common yet unofficial discussion is on a troubling scenario for Pakistan. Is this the 2nd beginning of the end of Pakistan as a country given the chronic sectarian and terrorist laden violence. The obvious reference point was the late 1960s when the first beginning of the end of Pakistan had started. The formation of Bangladesh ended the Jinnah's Pakistan of 1947. If Balochistan does breakaway from Pakistan that will mark the end of 1971 Pakistan. Two weeks later. . . .
1. Where is the concrete evidence that links RAW to the Karachi Ismaili or the Peshawar school incidents? 2. What was ISI doing while these events were being planned? 3. If RAW (if there is evidence that is) knows the whereabouts of these terrorists then train them and pays them then, why can't ISI find out who they are and finish them off? Mihir: "Where is the concrete evidence that links RAW to the Karachi Ismaili or the Peshawar school incidents?" What is the concrete evidence that the man named Ajmal Kassab who was hanged in India was an ISI agent responsible for carrying out Mumbai attacks? 1. When you hear the soundtrack of this video, does this man sound like a person born and raised in the town of Faridkot in Okara District of Pakistan's Punjab province? This question is particularly addressed to people of Pakistani Punjab who are familiar with the local accents. Police in India this week arrested a pigeon on charges of spying for Pakistan. As BBC News reports, the pigeon was taken into custody on Thursday after a 14-year-old boy found it in a historically tumultuous region along the India-Pakistan border. The bird, whose name has not been disclosed, reportedly had a "stamped message" on its body that was partially written in Urdu. The message also included a Pakistani phone number. An X-ray of the bird didn't show anything out of the ordinary, but police have nevertheless registered it as a "suspected spy" and are keeping it in custody. "This is a rare instance of a bird from Pakistan being spotted here," police superintendent Rakesh Kaushal told The Times of India. "We have caught a few spies here. The area is sensitive, given its proximity to Jammu, where infiltration is quite common." This isn't the first time that a bird has been caught in the middle of an international dispute. In 2008, Iranian authorities arrested two pigeons accused of spying on a nuclear facility, and a stork was detained in Egypt two years ago after being spotted with a mysterious device attached to its feathers. Others have been targeted as potential terrorists. Last year, Chinese officials probed 10,000 pigeon anuses amid fears that they may be carrying bombs. No word yet on whether the pigeon arrested this week has hired a lawyer. The attack took place in Mastung, about 40 miles southeast of Quetta. The buses had been on their way to Karachi, the southern port city in neighboring Sindh Province. One of the two buses was carrying passengers from Chaman, a Pakistani town on the border with Afghanistan. Before Friday’s shootings of the Pashtuns, militants from banned sectarian groups used to target buses of Shiite pilgrims, mostly in Mastung District, forcing them to also give up road travel in the province. While attacks on Pashtuns in Baluchistan have occurred in the past, killing them after stopping buses and checking identity cards for their ethnicity is a new development. A Pashtun lawmaker from the province, who spoke on the condition of anonymity because he feared retribution, said that the attack was aimed at disrupting a planned economic corridor through the province that would offer China easier sea access. The $46 billion worth of energy and infrastructure projects, pledged last month by China, center on a network of rail and road and pipeline projects. The lawmaker said that on Thursday, during a meeting with Prime Minister Nawaz Sharif, representatives of all political parties had reached a consensus about the project as the government tries to calm suspicions that some regions would be left out of the project and that Punjab Province, the political base of Mr. Sharif, would be the only beneficiary of the increased economic activity with China. Security officials say a search is being carried out by 200 troops across Mastung District. Later, Mr. Sharif said he was concerned about the involvement of “foreign intelligence agencies” in destabilizing Pakistan. Pakistani officials accuse India of supporting terrorism inside the country, and in recent months, Pakistan’s top civil and military leaders have accused India of backing separatists in Baluchistan. India has denied involvement. Naturally, this treaty (China-Pak economic corridor or CPEC) has turned a lot of heads. And no country is more obsessed with Pakistan than India. India’s paranoia and lunacy-inducing obsession with Pakistan has found a new face under Mr Narendra Modi’s leadership. This obsession is not mutual. Our prime minister or leaders of the second and third largest party did not feel the urge to make remarks about India in their election campaigns. Our federal ministers and advisors have not, until very recently, commented on Indian Research and Analyses Wing’s (RAW) involvement in covert activities within our borders, as opposed to India blaming everything from a bombing to their prime minister’s bowel movement on our Inter Services Intelligence (ISI) for years. Modi is very open about his nationalism and Hindu fanaticism, his security advisor is very blunt about his intentions towards Pakistan. Under Modi, India seems to have done away with subtleties and is now openly expressing its designs to further weaken Pakistan by all means necessary. Modi, behaving typically like a jealous toddler, has termed CPEC as “unacceptable” for India. He did so in his incredibly awkward, over-excited, selfie-inclusive, posing and proposing visit to China, but the Chinese president snubbed his unsolicited opinion like any prudent adult would snub the tantrum of a spoilt toddler. Modi has now repeated his unsolicited opinion through one of his ministers. It appears that Modi’s cabinet deliberated in length over its stance on CPEC. Of course, it was pre-decided that they would oppose it, but on what grounds? They couldn’t just say “because we say so” or “because we don’t want Pakistan to prosper”. Honest as these statements would be, they just wouldn’t be diplomatically correct. So the geniuses came with the stance that CPEC passes through Pakistan-held Kashmir, and since Kashmir is disputed, we cannot accept CPEC. And they now wait, hoping this ludicrous stance would find an international audience. If you want to find Indian-supported local opponents to CPEC in Pakistan, look for an equally insane stance; some Baloch nationalists have spoken against CPEC on grounds that since it would bring heavy investment and development to the region, there will be consequent migrations from different parts of Pakistan, hence rights of Gwadar locals may be infringed. India would not stop here though. China has already warned Pakistan of RAW’s intentions of sabotaging CPEC with help from local militants. Pakistan has only recently broken its decade’s old silence on RAW and India’s involvement in terrorist activities in Pakistan. India is, undoubtedly, our bitter rival. Civilian casualties have been particularly high, according to the report, totaling around 26,270 deaths in Afghanistan and 21,500 in Pakistan. The study says that most of the civilian casualties in Afghanistan are caused by militant groups, but the number caused by international forces has been increasing since 2012...The turmoil in Pakistan, which has its own Taliban and al Qaeda factions, has become more closely related to that of Afghanistan, with refugees and anti-government militants crossing borders. "It is important for policy makers and others to view the effects and implications of these wars together, because they are so interconnected," said Neta Crawford, the author of the Brown study. In his recent trip to Bangladesh, Indian Prime Minister Narendra Modi declared that his country played an important role in the liberation of Bangladesh from Pakistani in 1971. The eastern wing of Pakistan - now Bangladesh - seceded from the former West Pakistan after a protracted struggle for the economic and political rights of the Bengalis that were severely curtailed by the rulers in Islamabad. "The Indian PM was candid to say that India supported the 1971 war of liberation. But this is not tantamount to interference in Pakistan, as New Delhi, as a friendly neighbor, stood by Bangladesh whose independence was proclaimed on March 26, 1971. Therefore, it was support from one country to the other against its fight with a third country (Pakistan)," Bangladesh Information Minister Hasanal Haq Inu told an Indian newspaper on Thursday. To make matters worse, India's Deputy Minister for Information and Broadcasting, Rajyavardhan Singh Rathore, said Wednesday that India "will carry out surgical strikes at the place and time of our own choosing," referring to the Indian army's cross-border attack inside Myanmar against insurgents. "Western disturbances will also be equally dealt with," the minister said during a press briefing when asked if India could also carry out strikes on the Pakistani border, according to a report published by a local news agency. Ahmed believes that war rhetoric would only benefit the two countries' armies, defense industries, ultra-nationalists, and religious extremists. "Who are the Indian politicians doing a favor to? Certainly not to PM Sharif's civilian government. They are giving a reason to Pakistan's army generals and their stooges - the Islamists - to create an atmosphere of hatred and jingoism in the country," he said. Narendra Modi's election to Indian premier in May 2014 led some to expect a lasting diplomatic solution with Pakistan. Modi made the first move, as he invited Sharif to attend his oath-taking ceremony in New Delhi. Sharif opted to reciprocate Modi's friendly gesture and went to the Indian capital on May 26 with a "message of peace." Experts said it was an unprecedented step by a Pakistani leader to engage on such a high-level with a Hindu nationalist like Modi, who was allegedly involved in a Muslim massacre in Gujarat in 2002 as the state's head. "There were high hopes for the improvement of bilateral relations between India and Pakistan with the fresh start of a new government. Before Prime Minister Modi came to power, the relations between the two neighbors were at an all-time low as all bilateral processes had been interrupted," Sarah Hees, Resident Representative of the German foundation Friedrich-Ebert-Stiftung in India, told DW. But in less than two months after the historic meeting of prime ministers Sharif and Modi in New Delhi, the armies of the two nuclear-armed South Asian nations began to trade gunfire along the Kashmir border. Things were back to square one in a very short time. Indo-Pakistani ties have never been cordial, but the recent escalation of tensions have upset the neighboring countries' peace activists, who say that the blame game from both sides would be harmful for the masses who need peace and development more than anything else. "If conflict persists, fundamentalist groups in India and Pakistan will benefit. The right-wing groups in both countries want war and animosity," Baseer Naveed, senior researcher at the Asian Human Rights Commission in Hong Kong, told DW. This has pitted the two rival jihadist groups against each other, with clashes erupting between them in provinces including Helmand in the south, Nangarhar in the east and specifically involving Iran-backed Taliban in Farah, near Iran’s border, Afghan officials say. Geo News has obtained a single page of another alleged document of London Metropolitan Police, in which MQM leaders Tariq Mir and Mohammad Anwar confessed of receiving Indian funding. Sarfraz Merchant, a Karachi trader among six men being investigated by the British investigators for money-laundering with MQM, told Geo News early on Wednesday that he shared the document with two former MQM leaders. Apparently, one of the two leaders leaked the document in the media, he said. The document has come to the fore hours after the Met police disowned an alleged confessional statement by MQM senior leader Tariq Mir, saying the document was not part of police record. The alleged document carries Merchant's pre-interview briefing by the Met Police and elaborates on what lines the investigative authority was probing the money-laundering allegations on MQM. It also says the large amount of cash were confiscated from a building associated with MQM and a significant amount of assets identified in the UK. “All or part of the cash and assets are believed to represent funds provided to MQM by the Indian government or other unlawful activity,” says the document. numerous crimes, including murder, extortion and arms smuggling. Kumar Doval, former head of the Indian Intelligence Bureau (IB). A leading Baloch separatist has said he is ready to consider dialogue with Pakistan, as long as the army ends military operations in the province. Brahamdagh Bugti told BBC Urdu his party could drop calls for independence if "the Baloch people agree". Mr Bugti, who lives in Switzerland, is accused of leading an armed struggle. Balochistan has seen a long-running conflict between security forces and separatists who want a greater share of the province's natural resources. Brahamdagh Bugti, 34, is regarded as one of the most hardline of the Baloch separatist leaders and has until now been opposed to any rapprochement with the Pakistani state which he has vowed to "fight to the death". His remarks are being viewed as an olive branch to the military and could signal the first softening of attitudes within the separatist movement. AWARAN, Pakistan — The promise of an AK-47, money and a new motorcycle tipped Hammad into militancy at the age of 20. "I was given three men, a motorbike, a Kalashnikov and 15,000 rupees [$150] per month," the 23-year-old said. This was a big deal for a middle-school dropout from a region with few jobs and even fewer roads. Hammad learned how to assemble bombs, which added to the thrill of fighting to carve out a separate state for his people, the Baloch. "My task was easy. To destroy [military and paramilitary] vehicles…Just plant a mine or fire a rocket and zoom off," said Hammad, who asked to be identified by his first name only. But fighting for independence from Pakistan soon turned sour. Is india planning something big in Pakistan??? In coming months? The wheel has come full circle at the Research and Analysis Wing (RAW). Already reeling under the impact of the Rabinder Singh episode—the senior RAW officer is suspected to have defected to the US—there may be more skeletons tumbling out now at India's premier spy agency. For the first time, the firm has admitted that eight of its key operatives have gone missing—almost all while on critical assignments outside the country— since the agency's creation in the late '60s. Rabinder is the ninth such known man on the defectors' list (accessed by Outlook). The file with the names is now on the desk of Prime Minister Manmohan Singh. Most of the cases go back a few decades but some names are likely to cause deep embarrassment in the spy community. Most of these operatives disappeared while on posting, relocating themselves to countries in North America and West Europe under assumed names and false passports. A number of them, it now turns out, were well-guarded 'assets' in the hands of foreign agencies, a euphemism for double agents, and are now green card holders in the United States or UK citizens. Now with the Rabinder Singh episode opening up a can of worms, RAW has been forced into damage control mode. Last fortnight, the PM ordered the file detailing the missing ex-RAW sleuths to be put up before him. Incidentally, that's when intelligence officials sought to make a differentiation between those who had settled down in the US or UK after retirement—and coincidentally there are scores of them—and those who disappeared without a trace with important confidential documents and information. The list of nine belongs to the latter category. Prominent among the names is Sikandar Lal Malik, personal assistant of RAW founder and superspy, Ramnath Kao. Malik, say RAW sources, was privy to the top-secret decisions taken by Kao during the tumultuous early '70s, including the plan to "liberate" Bangladesh. On a US posting, Malik disappeared one fine morning and is presumed to be living somewhere in that country now. His defection was a closely guarded secret for many years and is only now being acknowledged as a 'blow' to the agency's reputation. According to sources, it took the agency several years to assess the damage caused: Malik had crucial information because most of Kao's highly secret correspondence was handled by him. For foreign agencies, which otherwise had little access to Kao, the 'winning over' of Malik was a coup. This, because with Malik went a treasure trove of classified information, which may not have been known to anyone other than Kao himself and his boss, the then prime minister, Indira Gandhi. M.S. Sehgal, a senior field officer close to former RAW chief Girish Saxena. Disappeared while posted as attache in London in 1980. N.Y. Bhaskar, a former attache in Tokyo, managed a green card; was supposed to be liaisoning with the cia. Later, disappeared without a trace in the US. B.R. Bachhar, senior field officer, disappeared in London. As attache in Kathmandu, he was liaisoning with foreign intelligence agencies in the early '80s. Major R.S. Soni, an undersecretary in RAW on the Pakistan desk at HQ, is believed to have escaped to Canada in the early '80s. Three months after escape, salary was still being deposited in his account. Shamsher Singh Maharajkumar, an ex-IPS officer posted in Islamabad, Bangkok and Canada. Reportedly settled in Canada after retirement. He's related to the royal family of Nabha in Punjab. Ravi you better get few English lessons first!!! First, why does Jadhav have two passports, one in his own name and another in the name of Hussein Mubarak Patel? According to The Indian Express, the second passport was originally issued in 2003 and renewed in 2014. The passport numbers are E6934766 and L9630722. When asked, the Ministry of External Affairs (MEA) spokesperson would only say that India needs access to Jadhav before he could answer. But why not check the records attached to the passport numbers? Surely they would tell a story? Additionally, The Times of India claims that since 2007, Jadhav has rented a Bombay flat owned by his mother, Avanti, in the name of Hussein Mubarak Patel. Why would he use an alias to rent his own mother’s flat? Perhaps Jadhav changed his name after converting to Islam? But then, why did he deliberately retain a valid passport in his old name? Indeed, why did the government let him, unless he deceived them? Second, the government claims Jadhav was kidnapped from Iran and forcibly brought to Balochistan. A former German ambassador to Pakistan, Gunter Mulack, at least initially suggested this was true — but has the government pursued the matter with Mulack? If it has, that hasn’t been reported, nor has what he revealed. However, we did pursue the matter with Iran, but, as the MEA spokesperson admitted, they don’t seem to have responded or, perhaps, even conducted an investigation yet. We seem to have accepted that. If Pakistan did abduct Jadhav, don’t we need to ask why? Doesn’t that raise the question of what was so special about him that made them do this? After all, there are 4,000 Indians in Iran — and no one else has been abducted. Third, both The Indian Express and Asian Age suggest that Jadhav has links with the Pakistani drug baron Uzair Baloch. Did he play dirty with him and get caught in a revenge trap set by the drug mafia? Given that Jadhav was arrested a month after Baloch, this could be part of the explanation. Finally, The Indian Express has reported that between 2010 and 2012, Jadhav made three separate attempts to join the Research and Analysis Wing (R&AW). The paper suggests he also tried to join the Technical Services Division. What more do we know about this? Even if the media doesn’t, surely the government does? A. S. Dulat, a distinguished former chief of R&AW, has unhesitatingly said Jadhav could be a spy. As he put it, if he was the government, he would hardly admit it. Just a few days before Jadhav’s sudden conviction and death sentence, the Pakistani media claimed a retired Pakistani army officer, Lt. Col. Muhammad Habib Zahir, had gone missing in Lumbini, close to the Indian border. The Pakistani media is convinced he’s been trapped by R&AW. Was Jadhav convicted and sentenced to preempt India from claiming it had caught a Pakistani spy? And now, is an exchange of ‘spies’ possible? I’m not sure who will answer these questions, and perhaps it would not be proper for the government to do so, but whilst they hang in the air, the mystery surrounding Jadhav will only grow. Simply but aptly titled “The mysterious Mr Jadhav”, well-known journalist Karan Thapar has written a hard-hitting article about the Indian spy who has been sentenced to death by a military tribunal in Pakistan. Mr Thapar said he was intrigued by Kulbhushan Jadhav’s story. So he began reading about it, but the more he read about it the more he became confused. “Alas, all I’ve ended up with is questions. The more I learn, the more they multiply,” he wrote. The first thing that troubled the Indian journalist was why Jadhav had two passports, one in his own name and the other one in the name of Hussein Mubarak Patel. “According to the Indian Express, the second passport was originally issued in 2003 and renewed in 2014. The passport numbers are E6934766 and L9630722,” he wrote. The Indian journalist quoted A.S. Dulat, a former chief of RAW, as saying unhesitatingly that Jadhav could be a spy. “As he put it, if he was the government, he would hardly admit it,” he wrote. by Mohanlal Bhaskar. Translated by Jai Rattan. Shrishti. Pages 329. Rs 295. AN Indian Spy in Pakistan is the true account of Mohanlal Bhaskar, a spy and an Indian espionage agent in Pakistan. In his preface, Khushwant Singh says, "Not all the wealth of the world would persuade me to undergo what Mohanlal Bhaskar had to go through in the jails of Lahore, Kot Lakhpat, Mianwali and Multan. It is a miracle that after all that he lives to tell his tale, retain his sanity and teach in a school"
Bhaskar was on a mission to find out information about Pakistan’s nuclear bombs. Betrayed by one of his colleagues — a double agent who was also subsequently arrested and had to face his own demons. "Would he (Amrik Singh) be able to go back to his own country alive? And even if he succeeded in doing so would life be worth living? Would the Indian Government spare him? Such thoughts had driven him mad. The hunter was caught in his own net." However, Bhaskar was condemned to prison and torture in an alien country where he was to spend 14 years of his life. Perhaps he would not have been allowed to emerge alive. His salvation came when he was exchanged for Pakistani spies held by India. The novel, originally in Hindi, has been translated into English by Jai Rattan. Says Khushwant Singh "Jai Rattan’s translation from the original Hindi reads very well. I can recommend it to readers who have the stomach to take in suspense and horror"
It has nurtured the seeds of martyrdom in us"
While the audience applauded vociferously, one man questioned his sentiments to which Bhaskar responded, "If it’s a question of serving my country I will not be found wanting. I’m prepared to serve with my life and soul in whatever capacity you want me" And so silently that not even his family got to know of it, Bhaskar "quietly underwent circumcision and became a Muslim convert`85.even my wife was not aware of this momentous fact"
The novel is set at the time when "Ayub’s swagger had lost some of its bounce. Bhutto’s star was in ascendancy`85he had won over the people of Pakistan to himself, and was now hanging like Damocles’ sword over Ayub’s head`85martial law was proclaimed and the jails filled in no time`85It was during this period of turmoil that I had started making incursions into Pakistan"
The novel is full of descriptions of the torture that Bhaskar and other prisoners had to undergo at the hands of the Pakistani police and army. However, these accounts of inhuman torture are interspersed with descriptions of the many interesting people that Bhaskar came across in the Pakistani jails. People who were sadistic and cruel and people who showed unexpected kindness. For example he writes of Havaldar Abdul Rahman Khatak "who even in prison had helped me to keep up my morale`85his love and affection were like a fountain a desert which sprays cool, life giving water`85there was no hatred for me in his heart`85when I think of him my head is bowed in gratitude." Another fact that Bhaskar brings to light time and again is the shared lineage and heritage of the people of the two warring nations. Raja Gul Anar Khan, who was considered to be "a living terror" traced his history back to Chandravanshi Rajputana while certain others had Sikhs as their forefathers but in turbulent times converted to Islam either by choice or necessity. These and many other such colourful characters pepper the pages of the book, which in spite of its many printing errors, is an easy read. RAW and Tamil Tigers: According to the Jain Commission, which was set up by PM Narasimha Rao, India trained five extremist organisations using the Research and Analysis Wing (RAW) – the Liberation Tigers of Tamil Eelam (LTTE), People’s Liberation Organization of Tamil Eelam (PLOTE), Eelam People’s Revolutionary Liberation Fron (EPRLF), Tamil Eelam Liberation Organization (TELO) and Eelam Revolutionary Organization of Students (EROS). The Indian Air Force undertook ‘Operation Poomalai’ to help the besieged Tamil Tigers in the town of Jaffna. The Jain Commission says that RAW provided camps across Tamil Nadu to each of the five extremist organisations where they learned the deadly tactics of suicide bombing. For the record, one hundred thousand Sri Lankans were killed during the course of the Sri Lankan civil war. On February 27, 2012, WikiLeaks began publishing ‘The Global Intelligence Files’ whereby five million emails were exposed. According to WikiLeaks, militant organisations such as the Baloch Liberation Army (BLA) and Baloch Liberation Front (BLF) etc are materially and financially funded by CIA, RAW, MI-6, RAAM and Mossad to keep Balochistan destabilised through acts of sabotage and subversion. The BLA alone received Rs50-90 million per month. According to The Hindu of October 8, 2015, “India is preparing to take an aggressive position on Balochistan, in a marked departure from South Block’s Pakistan policy of the past.” The Hindu continues, “The new Indian position over Balochistan became public when Balochistan Liberation Organization (BLO) representative Balaach Pardili addressed a gathering in New Delhi….reading out a statement from BLO’s exiled leader Nawabzada Hyrbyair Marri. RAW and Mukti Bahini: On May 15, 1971, Indian Army’s Eastern Command officially initiated ‘Operation Jackpot’. RAW had set up training camps in the Indian states of West Bengal, Arunachal Pradesh, Bihar, Assam, Nagaland, Mizoram and Tripura. RAW equipped the Mukti Bahini with Italian howitzers, Dakota DC-3 aircraft, Otter DHC-3 fighter planes and Allouette helicopters. For the record, the Mukti Bahini killed anywhere from 1,000 Biharis (according to the ‘Chronology for Biharis in Bangladesh’) to 150,000 Biharis (according to the ‘Encyclopaedia of Violence, Peace and Conflict’; page 64). India has six neighbours – Bangladesh, Bhutan, Burma, China, Nepal and Pakistan. India has had border disputes with China, Pakistan, Nepal, Sri Lanka and Bangladesh. In 1974, India and Sri Lanka resolved their border dispute through an agreement. In 2015, India and Bangladesh resolved their border disputes when the Indian Parliament passed the 100th Amendment Act. India’s border disputes with China, Pakistan and Nepal are yet to be resolved. History is witness that in this part of the world the Research and Analysis Wing (RAW) laid the foundation of cross-border terrorism. multiple fundraising visits to the UAE, according to U.S.
their investigations and share further results. unwitting when they transfer money that ends up with the Taliban. India’s primary espionage agency and Pakistan’s Inter-Services Intelligence (ISI) have long been at odds in a long-standing battle for influence. Since its inception in 1968, RAW has had a close liaison relationship with KHAD, the Afghan intelligence agency, due to the intelligence it has provided RAW on Pakistan. This relationship was further strengthened in the early 1980s when the foundation was laid for a trilateral cooperation involving RAW, KHAD, and the Soviet KGB. Raman says RAW valued KHAD’s cooperation for monitoring the activities of Sikh militants in Pakistan’s tribal areas. Sikhs in the Indian state of Punjab were demanding an independent state of Khalistan. According to Raman, Pakistan’s ISI set up clandestine camps for training and arming Khalistani recruits in Pakistan’s Punjab Province and North West Frontier Province. During this time, the ISI received large sums from Saudi Arabia and the CIA for arming the Afghan mujahadeen against Soviet troops in Afghanistan. “The ISI diverted part of these funds and arms and ammunition to the Khalistani terrorists,” alleges Raman. Over the last forty years the organization has expanded its mandate and is credited with increasing India’s influence. RAW’s first leader, Rameshwar Nath Kao, led the agency until he retired in 1977. Many experts, including officers who worked with him, credit Kao with RAW’s initial successes: India’s triumph in the 1971 war with Pakistan, and India’s covert assistance to the African National Congress’s anti-apartheid struggle in South Africa. “To a large extent, it was Kao who raised RAW to the level of India’s premier intelligence agency, with agents in virtually every major embassy and high commission,” writes Singh. But the organization has been criticized for its lack of coordination with domestic intelligence and security agencies, weak analytical capabilities, and complete lack of transparency.